Identify the variables that affect sustainability and the resulting product specification in countries and regions such as Mexico, South America, India, Middle East, and China. Understand how water quality and pressure can impact the performance of plumbing fixtures within the international commercial restroom. Be aware of differing global standards and regulatory requirements and their influence on product specification and usage. Recognize design trends and aesthetic differences in restrooms around the world. Understand specific qualities of plumbing products that make them a superior choice for the international market. Designing and installing for the international market can be very different from the United States. There are many factors and challenges to consider that architects, designers, and engineers must educate themselves on such as aesthetics, water conservation efforts, and plumbing regulations. A growing trend today is for internationally based companies to seek out United States-based A & D firms to design their buildings. Creating the ideal design and function of the building, and in particular the restroom, can be a challenge due to differences in aesthetics, water quality, water pressure, regulations, and plumbing standards. It is important for domestic architects and designers to identify these differences and find viable solutions for every client that fit both their budget and their region’s specific plumbing needs. In order to specify the best possible products, architects and designers must educate themselves on the specific cultural trends, regulatory requirements, and water availability and quality of a given region. It is important, however, to keep in mind that even within a particular country, plumbing requirements and needs can vary. With this in mind, it is important to consult with local architects, designers, engineers, and other experts of the particular region to avoid problems. However, this continuing education course will provide basic instructions on vital aspects to consider when designing a commercial restroom for the international market. 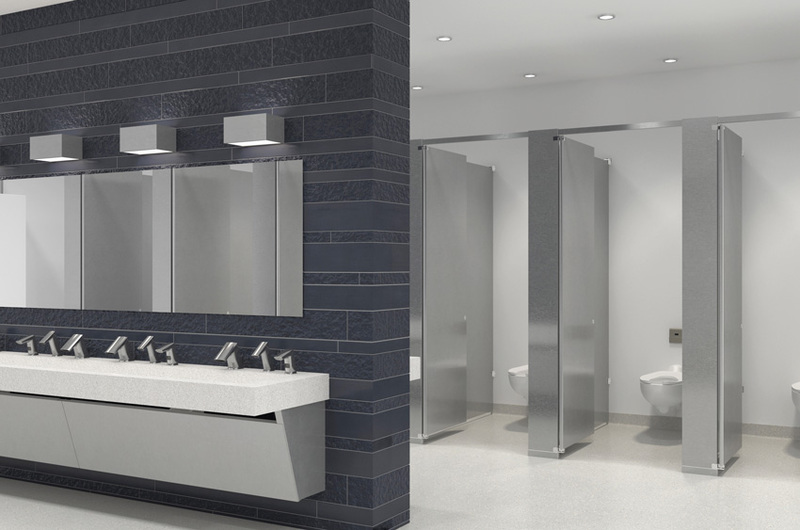 Around the world, the commercial restroom industry is always searching for dynamic solutions to improve the quality of life of the customers and communities that it serves. Globally, 2.5 billion people lack access to adequate sanitation services, making commercial restrooms an even greater need. Sustainability and water conservation are important across the globe, especially in developing countries, and it can be a major deciding factor in fixture/plumbing types across the board. India, for instance, is undergoing a major water conservation initiative set forth country-wide by the government. According to statistics reported by the United Nations, the world’s population is growing by roughly 80 million people each year. As a result, global water consumption has doubled in the last 20 years and commercial buildings use 20 percent of the world’s water, creating an overwhelming demand for access to fresh water and plumbing. At any given time, close to half of all people in developing countries suffer from a health problem caused by water and sanitation deficits. According to the Global Construction 2020 Report prepared by Global Construction Perspectives, $97.7 trillion will be spent on construction globally in the next 10 years. The rapid increase in population, water usage, and construction around the world, combined with the varying percentages of trained plumbers in each country, means that a simple-to-install, water-efficient plumbing solution is a must for commercial restrooms. High-efficiency products, such as low-flow flushometers for water closets and urinals, water-free and hybrid urinals, as well as low-flow sensor faucets are all water-saving solutions in commercial restroom design. These products can be used in new construction or as retrofits to help existing facilities conserve water. New construction has the advantage of starting with the latest flushing technologies and properly sized and pitched drain lines for both performance and water savings. Plumbing retrofit and renovation decisions are more difficult for existing buildings as the condition of the plumbing infrastructure behind the wall may be unknown. Therefore, getting accurate knowledge about the current infrastructure and green building standards/certifications a region is working towards is vital. The World Green Building Council (WGBC), a global network of Green Building Councils in more than 70 countries (United States and throughout South America, Middle East, North Africa, Asia Pacific, Africa and Europe), is one entity that promotes sustainability-focused practices in the building and construction industry around the world. A “green” building is one that adopts products and practices to reduce strain on the world’s limited resources, such as water. The members of WGBC work together to promote awareness and encourage the use of efficient products like solar-powered faucets. The Building Research Establishment Environmental Assessment Methodology (BREEAM), is another set of certifications that encourages the use of sustainable and water-efficient products. Created in 1990 by the Building Research Establishment (BRE), awarding a BREEAM certification means that a building makes effective use of resources, measured in 10 categories. These categories include: energy, health and wellbeing, innovation, land use, materials, management, pollution, transport, waste, and of course, water. Adopted in over 77 countries, BREEAM encourages the use of plumbing products that limit the strain on the finite water resource. However, there are other certifications around the world that encourage the use of sustainable water products. Variables ranging from the economic climate to the social customs to availability of resources will impact how much a region can work toward sustainability and which products it can use. After all, achieving those sustainability goals is just as important, if not even more so, than it is in the United States. 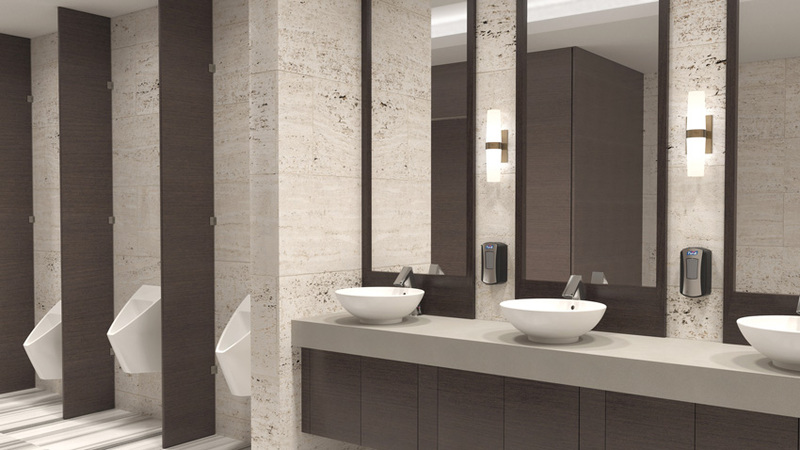 High-efficiency products, like water-free and hybrid urinals as well as low-flow sensor faucets, are water-savings solutions in commercial restroom design.